I love this time of year. It’s no longer really summer; and it definitely doesn’t feel like fall! However, I’m in that awful position where I just don’t know what to do with my wardrobe. Of course, anytime is a good time to buy jewelry and well, birds are so timeless. So here are some lovely transitional bird pieces to keep you going while summer fades and fall blows in. 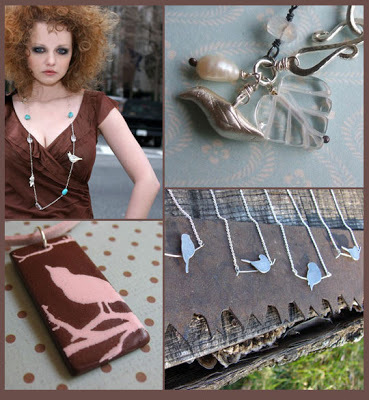 Thank you for including my Bird in Branches Pendant! What an honor to be among such talented designers! I love missficklemedia and her terrific pendants! PS And she is a Funtastic person too!! !